EPDP leader Douglas Devananda says he was to resign from his parliamentary seat because the people of Jaffna had not voted for President Mahinda Rajapakse. However the Minister says he is now reconsidering the move. The Eelam Peoples Democratic Party leader had earlier today made known to the people of Jaffna his decision to step down from his parliamentary position, as he felt the people had not been happy with his political stand. 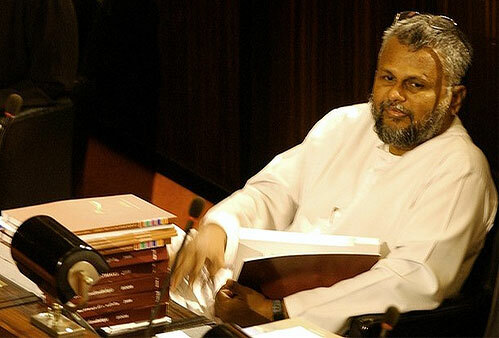 Speaking to Daily Mirror online MP Devananda said that during the run up to the elections he had asked the people of the North to trust him and stand by his decision for the betterment of the people, by voting in the incumbent president. He said that he had asked the people of the North to join with President Mahinda Rajapakse and ride with him in his presidential victory and had asked them not to be taken in by promises made by the opposition. MP Devanada said however that the people of the North had been mislead by the Tamil media that had claimed the opposition common candidate would not only win the presidential elections but also bring about the changes they longed for. The EPDP leader said that he had pointed out to them that it was only President Mahinda Rajapakse that could bring about any change but said that the people had not listened to him and voted for the wrong candidate. He said that under the circumstances, if the people of the North were not happy with his political decisions he felt it would be better if he resigned. He added that since the Tamil National Alliance (TNA) had at first been pro- LTTE and then during the presidential elections switched their alliances to the opposition candidate General Sarath Fonseka, the Tamil people would soon be without a leader. He said that the people of the North were now beginning to realize the mistake made by them. MP Devananda said once the news of his decision to step down from his parliamentary position was spread around Jaffna, many of his supporters had taken to the streets and staged ‘hartals’ asking that he reconsider his decision. The EPDP leader said that he had no intention of disrupting normalcy in Jaffna and for this reason alone had told the protesters and his supporters that he would reconsider his decision.